With my poor math skills, I thought a 6K walk/run meant it was 2 miles and I imagined it being a gorgeous, sunny day in late April. Come Unity sponsored a walk/run on a nearby campus to represent the average distance that a woman in Africa walks daily for water. That is 3.75 miles. I invited a few friends to join and was planning on walking and pushing The Littles. After checking the weather as the day approached, it became apparent it was going to be cold and possibly rain. I hate being cold. I almost decided not to do it but had already paid the registration fee. I lined up a sitter for the girls and decided to embrace any misery that might come on account of the cold weather as a very small identification with women who truly are walking for their survival and that of their family’s. 1 in 8 people on this planet lack access to clean drinking water. That means that when the women arrive, they fill up their jerry cans with water that might look like this. We definitely were not anticipating it would be hailing but I was in good company and so we put our heads down, pulled our coats closer and kept walking. I was so thankful that I didn’t have to bring my kiddos with me. I kept imagining the women doing this, most likely barefoot, possibly with toddlers lagging behind them or babies strapped to their backs. When we reached the 3k mark, we didn’t stop and spend time drawing water. We just kept on walking. We didn’t then load our arms, heads and backs with jerry cans that weigh around 40 lbs. They say the whole process takes an average of 3 hours and also pulls kids out of school as one of their jobs may be to bring the family’s water. In villages where a well is drilled, girls’ school attendance increases by 11%. When we finished, I was glad to climb into a warm car and then go about my day but it has given me much perspective. It has moved us to action points in our own family. I challenge you to mark off 3.75 miles and walk it while praying or just thinking about others who do this daily, for their survival. If you are really in shape, maybe add a 40 lb weight at the half way point and pray that God uses it to change your perspective. More facts about the water crisis HERE. After researching a bit, here are some organizations that build wells as an opportunity to further the Gospel. This list is missing some of the most popular organizations, but we believe that the end goal for building a well should not be building a well but rather, as a vehicle to show Christ love, give a cup of water in His Name and ultimately, further the Gospel. -World Vision has many ways to donate for clean water, from building a deep well ($13,700). a traditional well ($2,600), or shares in any of these, along with pumps, etc. -Gospel for Asia builds Jesus Wells. Living Water International builds wells in Jesus name as well as develops further ways to bring clean water to people with no access. Check out their “Take Action” tab and then under the “Take Initiative” tab for some great ideas on how you can get involved through some simple but very creative ideas. I recently found this on my mom’s camera from a recent sleepover The Littles had at Nana and Papa’s. Just too good to keep to myself. In unrelated news, if you are interested in joining the 7 experiment, let me know within a few days. There is something so wrong about waiting at Culvers until it opens to treat the kiddos. Before you judge, when taking twins to the doctor solo, you have to have a major bribe incentive on the other side. We did it. The Littles were calm, cool and collected while at the doctor and they got extra sprinkles. Okay, a slight exaggeration. But it sort of feels like it. Our house is listed as of today. I have lots of emotions about this but don’t quite know how to boil it down. Anyone want to buy a cute, little house on Main Street in Auburn? My cousin, Janel, is also hosting a huge garage sale at her parents’ house and invited me to add items. Another range of emotions. It has been hard for me to decide what to store, what to sell and giveaway. Even if you don’t live in the area, there are garage sales in the neighborhood, LOTS OF THEM. It would probably be worth the trip. Baby clothes, kids clothes, toys, furniture, home decor, kitchen, baby items, bags, new kitchen items, etc, etc, etc. and the dreaded “cheese” face. April 19, 2010 is a very important day in our family's history. The journey from referral to holding our babies for the first time (well, the 6 minute version of it). The Littles and I watched this together last night. As they watched pictures of themselves, they kept exclaiming, "Where's my Mama?" My heart ached and I answered, "I was coming babies". 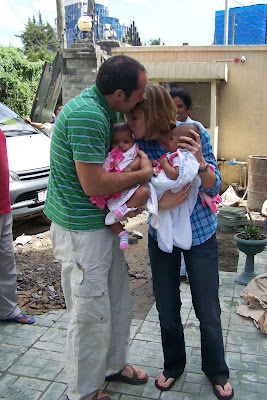 This morning, my heart is thankful but with a mix of joy and sorrow as I think of their birthfamily. Praising God from whom all blessings flow. I take back any statements referring to how smart our kitties are. Yes, I still maintain they are smart and wonderful but can no longer be called “the smartest” because of Purr’s insistence on climbing under Jon’s truck’s hood and riding away. He has done it three times and once, Meow accompanied him. The first time, he was gone for 24 hours. I thought a coyote had eaten him but Uncle Chad found him at his farm. As soon as The Littles woke up, we had a reunion with the prodigal cat. The Littles are cracking me up with their recent word combinations. Deceivingly, these pictures were taken in beautiful 65 degree weather. The Littles have their own opinions about appropriate accessories. The Littles prance around the house singing their own rendition of “Yankee Doodle” and have renamed it “Naked doodle” and it makes me laugh every time I hear, “Naked do dah day” or Little J stops and says, “Mama, what’s a naked doodle?” The song is so much more amusing when sung, “Naked Doodle went to town, riding on a pony”. They try to convince me to wear high heels around the house ALL day, bonus points for Mama if they are sparkly. “Ohh. Beautiful Mama”. Countless hours of underdoggies. These Littles love to “fing”. And play on the “monkey bars”. Sharing the swing with “Baby Blake”. Tip 1: Incorporate crowns and tiaras into your everyday routine. Just remember, there is no wrong day to wear a royal headpiece! To quote grandma, “We have the smartest kittens!”. Purr and Meow are doing well and already used their prowess to catch a bird. The Littles love them but still feel apprehensive about picking them up, due to an early misfortune that involved claws. Little A teaches Purr how to play “tunnel”. We spent a wonderful weekend celebrating Palm Sunday with family in Michigan. We missed you, Justin and Sarah!